Battlefleet Gothic: Armada, the latest in a flood of Games Workshop tabletop properties to be made into a videogame, was announced back in January with a handful of screenshots. The teaser video released today doesn't show off a whole lot more than what was in those still images, but it moves, and it has music—and it really is very gothic. I'm not terribly familiar with all the many and varied permutations of Games Workshop's Warhammer 40K setting, but the staff here who is tells me it's an RTS about battling for control of the Gothic sector of space at the head of an Imperial, Chaos, Eldar, or Ork fleet. 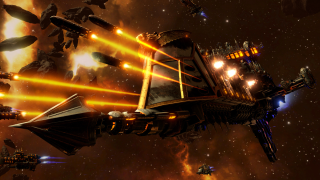 "Battlefleet Gothic: Armada offers deep management of every ship composing the player’s fleet, both during and between battles," says the press release. "From the fastest frigates to the gigantic, miles-long battleships, the player will customize all aspects of his ships: weaponry, defense and support sub-systems, etc… each customization affecting the very performances of the ship and the special abilities available during battle. From battle to battle, the admirals and crew of surviving ships will gain experience and promotions, improving the battle-readiness of the ships for future, bigger and more dangerous battles." It's not the most informative blurb ever, but I really dig the visual style and so I will continue to watch. Publisher Focus Home Interactive said more information will be coming "very soon," and in the meantime you can sign up for the newsletter at battlefleetgothic-armada.com.